I don’t know about you, but for me whenever I go food shopping, as I scan the aisles it is there that I come up with endless ideas for new cakes and pastries. That, along with my insatiable hunger cravings are the two most alluring factors. As the end of summer is approaching, also ending is the abundance of fresh fruits and berries that come along with the season. Knowing this, I decided to have one last hurrah with a few pounds of fresh strawberries to make this White Chocolate Strawberry Cake. I thought, fresh strawberry compote with a douse of Grand Marnier cooked to a thick chunky preserve like consistency for the filling, between moist layers of white chocolate cake. Now, if any of you know me you will know that I am not a big fan of white chocolate. I just think it’s just too sweet and honestly it’s not really even chocolate, technically. But without going into that whole topic, let me just say that I LOVE white chocolate baked into a cake! I think you will love it too once you see how easy it is to make and the moistness from the cocoa butter makes this pound cake style cake a real winner to hold up the thick filling and white chocolate strawberry buttercream. This is a building on recipes project as all great layer cake are; meaning we have to make several recipes to get to the final but it is well worth it! Just follow along with my instruction and advice for making this easier: Prepare in advance! 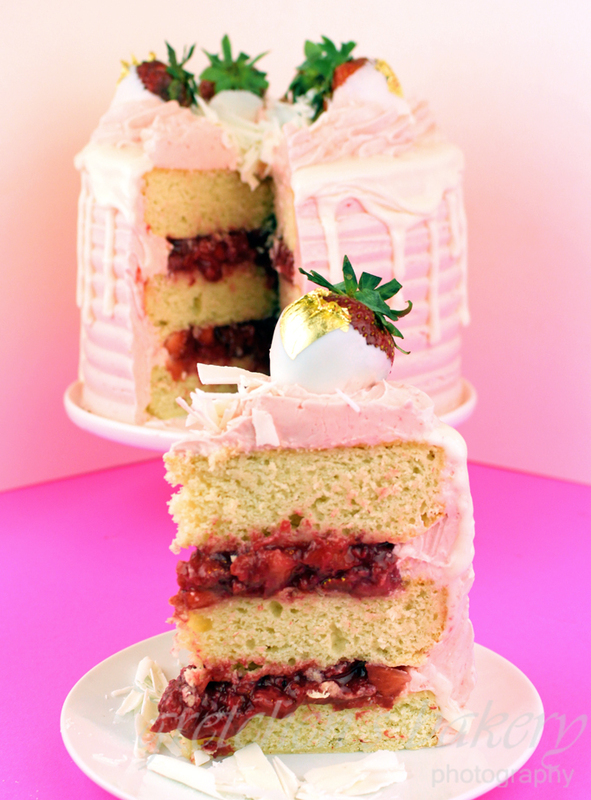 You can make the strawberry compote, white chocolate drip ganache and even the cake layers several days ahead of time. The buttercream too for that matter! I always work that way and then take just an hour or so on the day of the event to actually build the cake. It just makes life so much easier and way more fun to bake with an organized plan. Combine the flour, sugar, baking powder, EnerG egg replacer, and salt in a mixer bowl and sift it together or mix on low to combine. Bake in a preheated 350°F oven for 20 minutes then turn the oven down to 300°F for another 15 minutes or until they springy to the touch when you gently press the centers. Reserve about 1 cup of chopped fresh strawberries and then cook the remaining strawberries stirring often over medium heat until boiling, the berries will break down and release their juices but if they seem too dry add a few tablespoons of water to avoid scorching. Add the chopped strawberries to the cooled compote for the cake filling. Prepare the Aquafaba Swiss Buttercream as per the instructions on that recipe and add 1 -3 Tablespoons of Grand Marnier and 3 ounces of melted cooled white chocolate, then the reserved cooled puree. 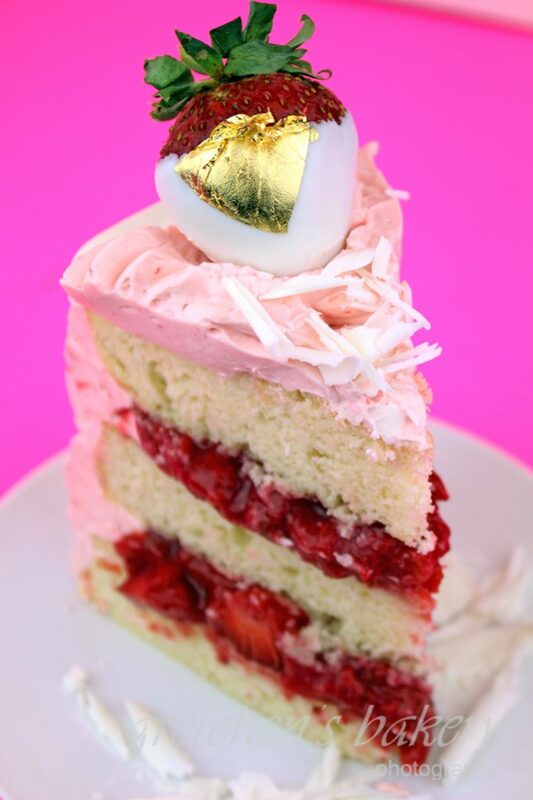 The white chocolate drip is made by combining the white chocolate and soy milk together in a small saucepot over low heat and stirring constantly until it is melted and smooth, cool before pouring onto the buttercream cake. Keep refrigerated but best served at room temperature. Hi Claire! thank you! I typically do include the weights for even baking powder and soda (apologies if at times I forget!) As for the sub in for another brand of egg replacer, Im not sure it would be the same so just be careful there. EnerG egg replacer includes Potato Starch, tapioca starch flour, leavening , calcium carbonate, citric acid, Sodium Carboxymethycellulose, Methylcellulose. 1½tsp od EnerG = 1 egg. For example when I use flax meal as the replacer, it is 1 Tbs for 1 egg, you can see how different egg replacers are not straight subs. So again just be wary there and maybe do a small test first. Hi Gretchen! Ive been following your recipes for a while, thats where I learned to make your fabulous SMB….Not really into vegan baking so my question is can I still get great results using non-vegan replacements and real eggs ….Thanks! Hi Gretchen, I am going to try baking this now! At what point did you add in sugar when preparing the cake? I couldn’t tell either from the video or your write up. I am hoping that all the dry ingredients go together per reverse creaming techniques. Hi! Im sorry for the late response, but thank you for catching my error! You are correct it goes in with the dry in the first step. Thanks again! I really enjoy your videos and blog (I am new to it). Thank you so kindly for your time!! I had a question. I wanted to make a vegan strawberry shortcake for a birthday (white cake layered with whipped coconut milk from a can). Do you think if I add this product “whip it” by Dr. Oetker to the whipped coconut milk, will work like dairy whipped cream? As well, if I add the coconut whipped cream (only in between the cake layers) the day before the event keeping in the fridge will it be okay for the next day? i.e. not dry and hard? I plan to frost the outside with your swiss meringue frosting (dairy free). Hi Thanks!! Im not familiar with this product (Im not sure my store has it or Ive seen it) But I would read the entire box/can? and see what it says in that regard, otherwise they probably have a phone number to call for questions/comments so I would definitely call them up. As for the filling the day before, the wonderful thing about coconut whipped cream vs cow cream is that is actually gets BETTER and more firm the next day! So yes go for it! It has been quite the learning experience for me since I started my vegan baking transition almost 2 years ago and I have learned lots! I am formulating an online course that addresses egg replacers specifically in cakes (as the first module) so if you want to be in the loop CLICK HERE TO SIGN UP! (No obligation to buy antyhing yet!) the course will be ready by early Spring. So my second part to this question is that it is always best to follow the recipes as written, but it would probably behoove you to do a small test with the flax to see how you like it, then if you are not satisfied try the enerG egg – I will be doing exactly that in my course, in once section: side by side comparisons of the same recipe with ALL the different replacers so you can get a visual idea of what the heck they are all doing differently so you can best choose how to proceed with all your recipes rather than follow word for word mine or someone elses! Also, can I use Vitalite (dairy free margarine)? Do you that in America? Hello Gretchen, I love all your recipes. I have a request, You’ve been using egg replacers like: Follow your heart, flax seed and now everG egg replacer. I know you like to use them all but on this end gets pricy, So sorry to say I cannot afford them all if I want to try a new recipe or I have to throw some of the egg replacers away because the dates expired. I know is too much to ask If you can give us the measure amounts on the other two choices would be great appreciat it. Thank you so much for everything you do. I made this cake yesterday using flax seed instead of Ener-G because I didn’t have any Ener-G. The cake turned out crumbly & didn’t slice well. Maybe the starches in the Ener-G would have held it together better. yes I found that the enerG really did help this one, not to mention enerG has added leavener to it so that is also considered when I developed this recipe. I’m sorry that happened to you!